Situated in the center of the United States means that Nebraska snakes have both an eastern and western character. 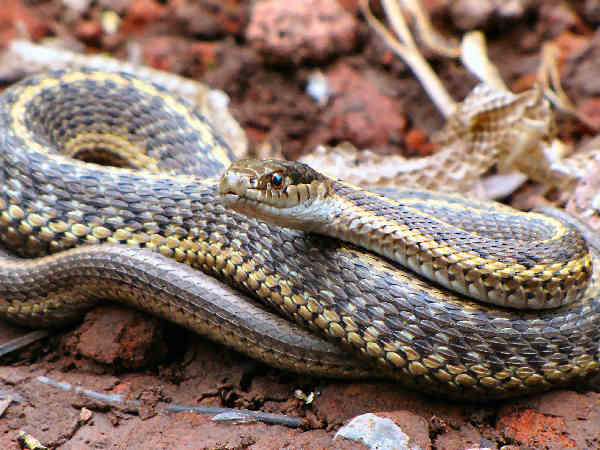 The approximately thirty snake species makes snakes the largest group of amphibians or reptiles in the state. Space limitations mean only a sample of representative species can be presented on this page. Please click the green Snakes button for more snake pictures and identification help. The picture shows the Nebraska native, the Plains Black-headed Snake (Tantilla nigriceps) A dark of black head contrasted against a different color body is the physical characteristic tying all the species together. Three different subspecies of the Western Terrestrial Garter Snake (Thamnophis elegans) inhabit western North America. One in Nebraska. The picture shows a typical wandering garter snake skin pattern, characterized by the light color stripes. A close up picture would show the snake’s eight upper labial scales, typical of all Thamnophis elegans subspecies. 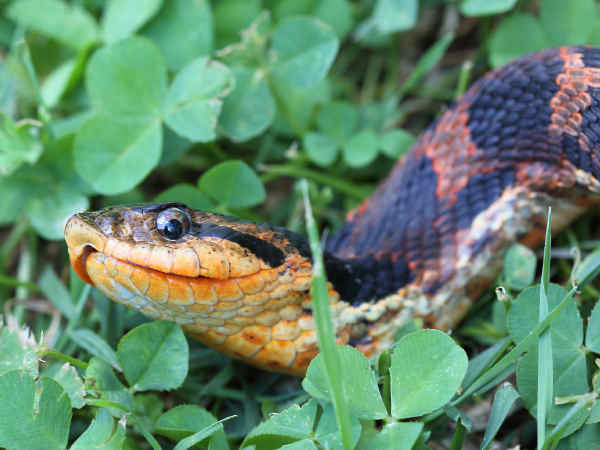 Nebraska residents can also find three additional Garter snake species slithering around their yards. 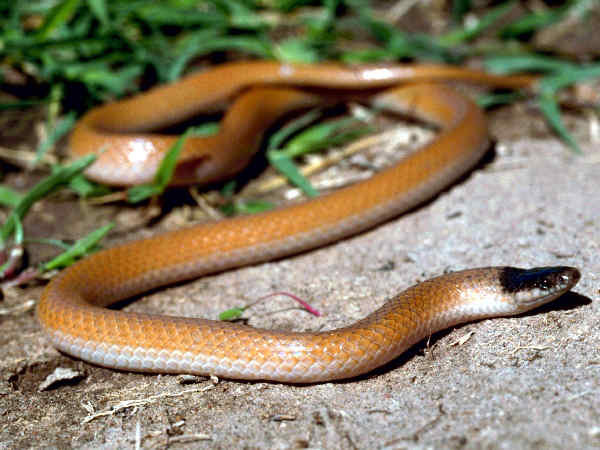 Look also for the Plains Hog-nosed Snake (Heterodon nasicus). 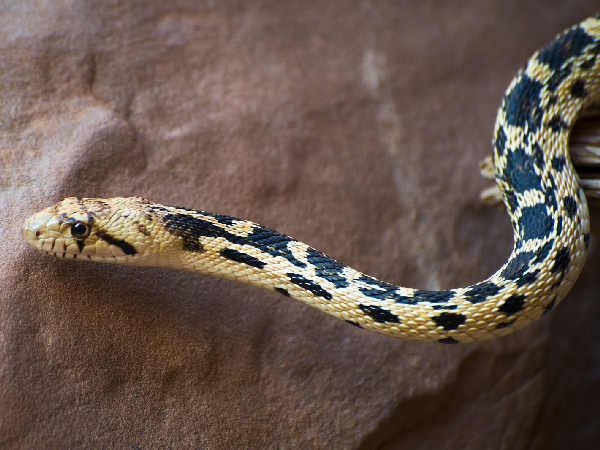 Kingsnakes experienced some evolutionary good fortune. They are immune to the venom of poisonous snakes such as Copperheads and Rattlesnakes, often making them the top snake in their territory. Speckled Kingsnakes (Lampropeltis holbrooki) follow that general rule of thumb. They inhabit areas of the Midwest and grow to an average size of about three feet. Check for Yellow-bellied Kingsnakes (Lampropeltis calligaster) and Central Plains Milksnakes (Lampropeltis gentilis) around the state. 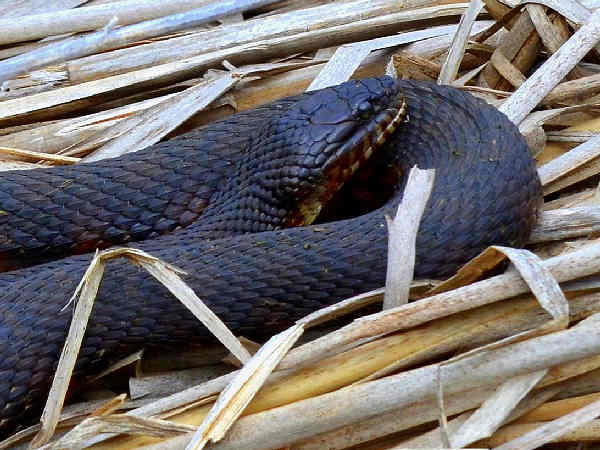 The Northern Watersnake (Nerodia sipedon) leads the list of water snake species in the most states, including Nebraska. It’s the only watersnake species. 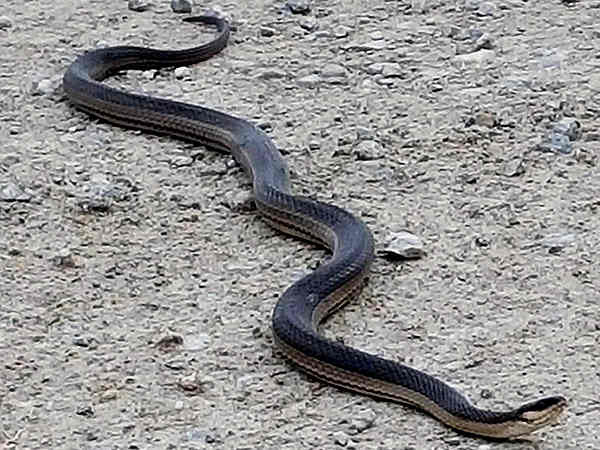 The picture shows a bulky snake with a dark body. As the snakes age their body color tends to darken. 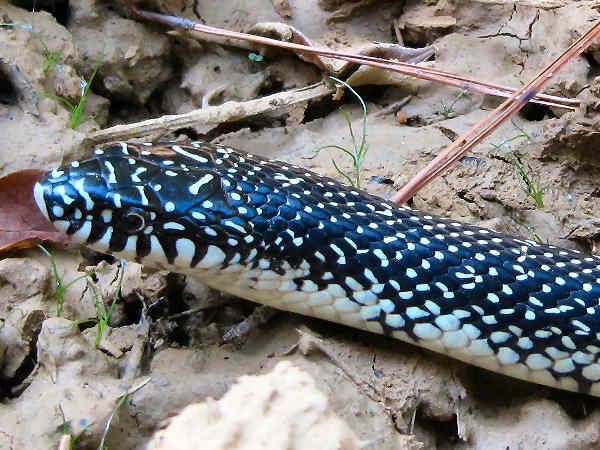 Younger snakes, especially when seen in the water, often have some colored pattern on their bodies. Size and a dark body are good field clues. They also help insure that the snake in the water is not the venomous Copperhead. Gophersnakes (Pituophis catenifer) look like rattlesnakes without the rattle. They tend to spend a good deal of time basking in the sun. That trait gives people sufficient time to check for a rattle. Nebraska hosts the Great Basin Gopher Snake in the picture. Snakes in the genus Regina (Queen Snakes and Gray Crayfish Snakes) are another of the common species in the Eastern United States that are less well known to the larger public. They inhabit most water areas of the East where crayfish are abundant. 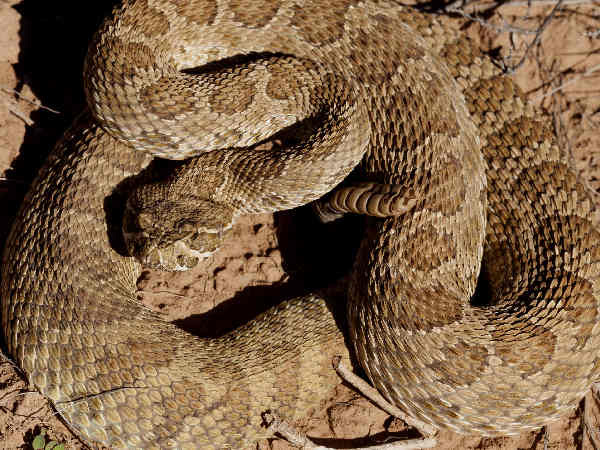 Nebraskans need only be concerned with two of the four types of venomous snakes, Copperhead Snakes and Rattlesnakes. 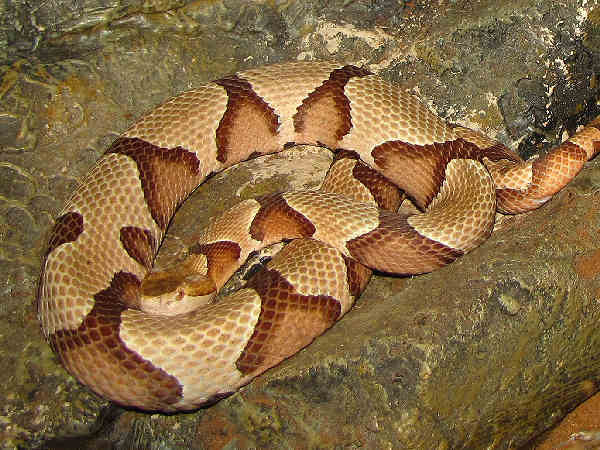 Copperhead snakes consume rodents in their territory. Unless directly disturbed, they are not known to be particularly aggressive in the presence of humans. Three rattlesnake species also live in Nebraska. Their presence in any specific area usually gets well documented. Prairie Rattlesnake (Crotalus mitchellii) range extends across sixteen states, mostly in the Midwest. Also look for the Western Massasauga (Sistrurus tergeminus).